For our little niece's birthday being celebrated at the beach, we just had to do a sea/beach themed party and of course, for a little girl, the party theme had to be mermaids! 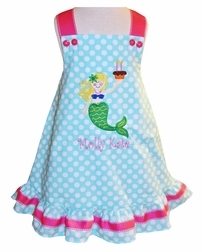 Using the beautiful color of the sea, the main fabric of the dress or top is a vibrant turquoise with white dots fabric with a ruffle at the hem. The shoulder straps are made from hot pink white stitched ribbon and the same, but a little smaller, ribbon is sewn on top of the hem ruffle. 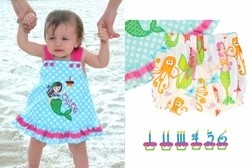 The front of the dress/top is appliqued with our own designed and digitized mermaid with long flowing hair IN YOUR CHOICE OF COLOR: BLOND, BROWN OR RED/ORANGE, holding a little birthday cupcake with either 1, 2 or 3 candles or the number 4, 5 or 6 candle with little yellow flames coming from the top. 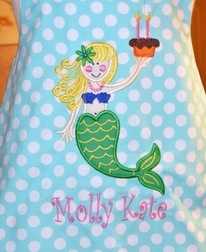 If you choose bloomers, they are made from Michael Miller's mermaids fabric as are the shorts. 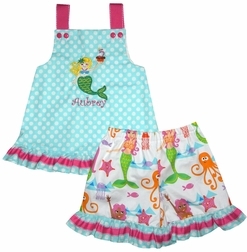 The shorts also have ruffles made of the turquoise with white dots and hot pink ribbon on top of the ruffles.